Kibbeh footballs, or “arras kibbeh” is an incredibly delicious and beautiful way to prepare classic Lebanese kibbeh. The balls are shaped with the kibbeh and stuffed with househ, a lemony meat/onion/pine nut mixture. 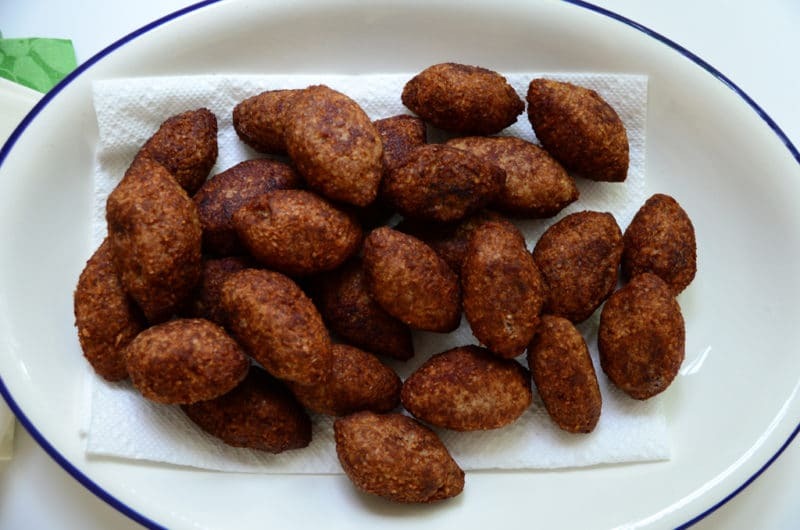 Read more about kibbeh meat here, and kibbeh recipes here and here. Try poaching uncooked arras in laban, comfort food at it’s best. Vegan tomato kibbeh is wonderful too! Try it here. One of the many great things about my home state of Michigan is that there are lots of Lebanese populating the state. This translates to one’s ability to find good Lebanese restaurants pretty much around the corner, at least if you live in the Lansing or Detroit area. It is a luxury that we take for granted until we spend any amount of time in other places, where there is no such thing as good pita bread and certainly no such thing as a go-to Lebanese restaurant nearby. In East Lansing, you can get phenomenal, traditional Lebanese food from Woody’s Oasis. The Lebanese eat there, if you know what I mean. Woody’s has always made it seem perfectly normal to have foods like fatayar and arras kibbeh (kibbeh footballs) at events like tailgaters or your kid’s fifth birthday party, even when your last name is Smith. So if we were putting together a tailgate menu and decided to make the chicken but not the fatayar or the kibbeh footballs, that wouldn’t mean we’d be going without those delights. It just means we’d be getting them from Woody’s. I did enjoy making kibbeh with Georgina and our little cooking class at Tawlet in Beirut. I loved the restaurant and everything about being there, including the rosewater elixir that started our evening and the butter cookies (we’ll make them) that ended it. But I didn’t walk away having pocketed the secret formula, the golden ticket of kibbeh-shaping techniques that I had hoped for. We made big domes that were meant to be grilled, a specialty of northern Lebanon. Nice, but still. I was, and still am, after the perfect shape, the football shape, that Woody’s puts out like a machine (but not) and that seems so elusive when the arras are made at home. I know, I know, the rustic look is so Saveur magazine. So real-deal. And no matter the shape, the arras are so savory and good that you can’t stop eating them even when there is a tin of seven-layer cookie bars, a bag of Snickers, and an apple in your pocket still to be had. It’s just that there is this part of me that craves the ability to make the perfect lines of a perfect kibbeh football the way my brothers crave a perfect Hail Mary touchdown or the perfect good-old-days of Lou Holtz. The secret to making perfect kibbeh footballs is no doubt the same one that wins the game: practice, practice, and then practice some more. And if you love doing it while you’re at it, you’re going to play like a champion. 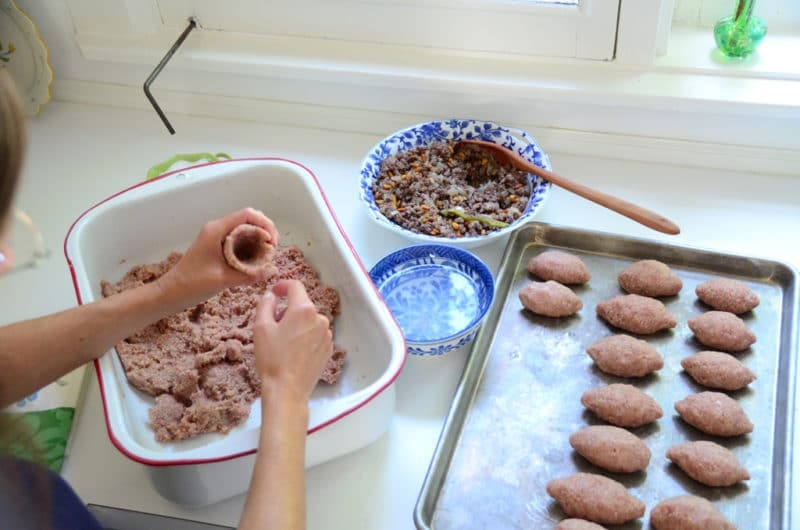 The kibbeh balls are versatile—they can be shaped as patties, balls, or the traditional torpedo/football. They can be stuffed or not stuffed at all. 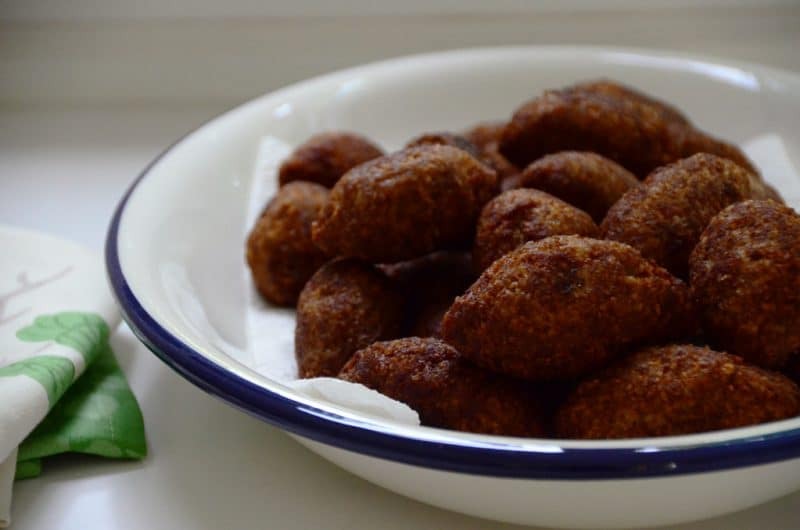 One of the most delicious things you can eat is a kibbeh football right out of the fryer (but they can be baked). Kibbeh footballs are great for a picnic eaten room temperature, or served warm with tahini sauce or hummus, labneh, and good flatbread or pita bread. 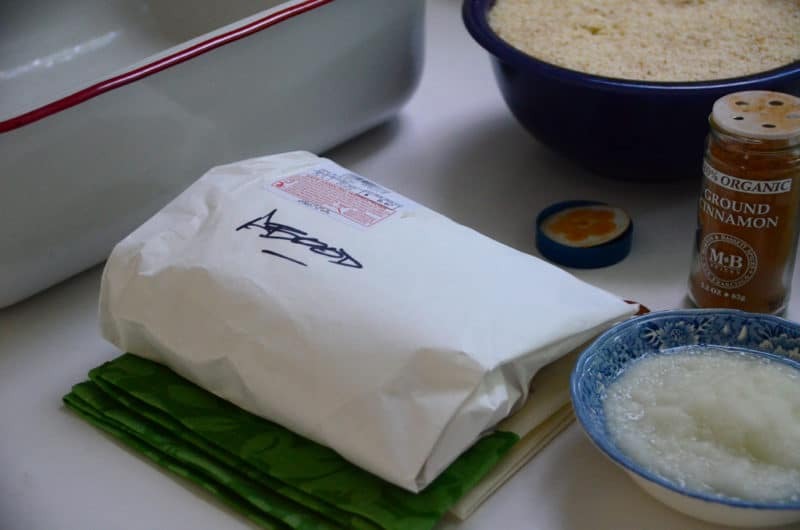 This recipe makes about 40 arras kibbeh. Heat the olive oil in a large skillet over medium heat. Add the onion, season with a little salt, and sauté until soft and translucent but not browned. Add the meat, season with salt, cinnamon, and pepper. Cook the meat, breaking it up into small pieces as it cooks, until just cooked through. Stir in the lemon juice. Remove from the heat, transfer the househ to a bowl, and add the pine nuts. Set aside. To combine the kibbeh meat, keep a small bowl of ice water nearby to keep hands wet and cold. 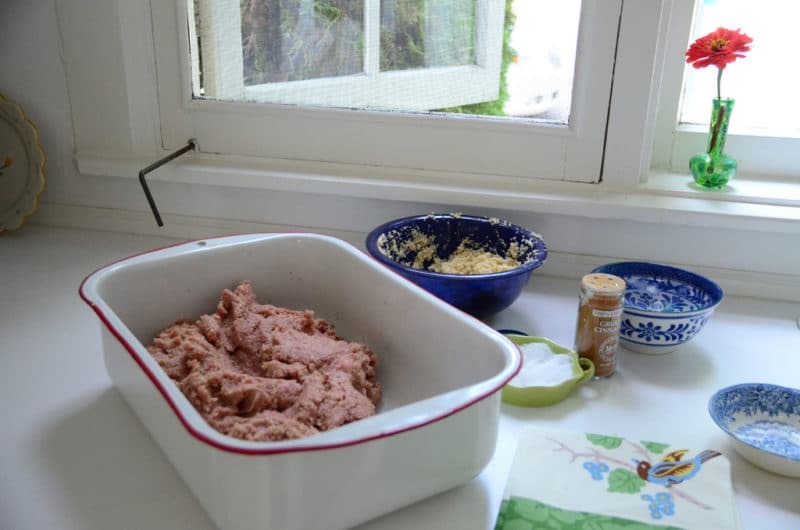 In a large bowl, knead the meat with the pureed onion and about half of the cracked wheat. 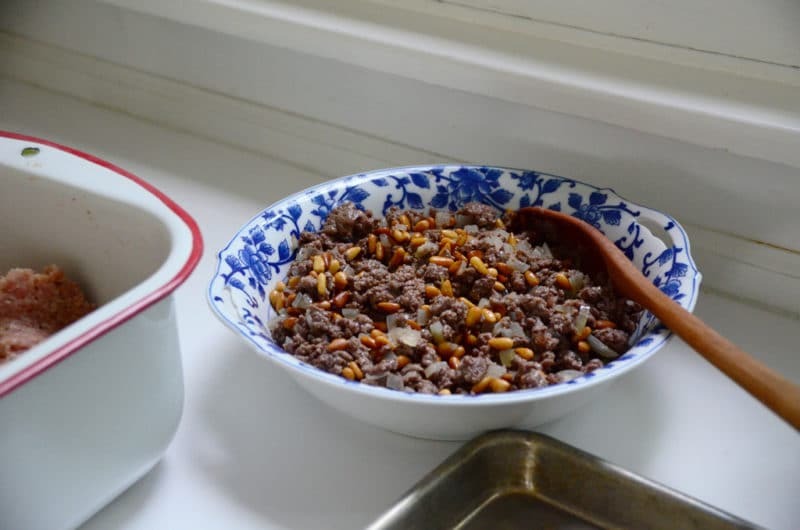 If there is any visible water left in the bulgur from soaking, squeeze it out of the wheat before adding it to the kibbeh. Dip your hands in water as you knead, adding about 1⁄4 cup of the water in total; be careful not to add too much water to the kibbeh or it will become mushy rather than simply soft. Add the wheat 1⁄2 cup at a time until it’s fully incorporated. Season with salt, pepper, cayenne and cinnamon, tasting and adjusting the seasoning. Keep the bowl of ice water handy. Take about 2 tablespoons of the meat “dough” and shape into a ball. Wet the the palm of the hand the dough is resting in with cold water, and use your first finger of the other hand to hollow out the ball of meat by pushing into it. The walls of the meat should be about 1/8” thick all the way around. Keep the meat in an oblong/torpedo shape for footballs, or a ball shape for balls. 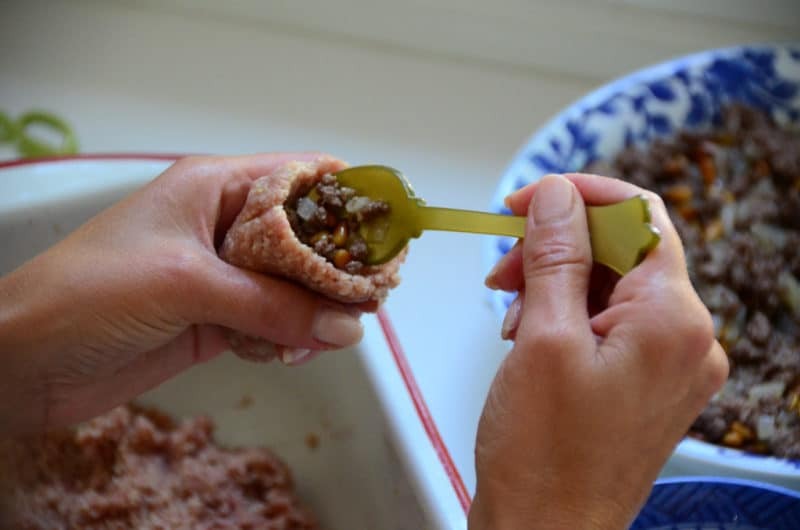 Using a demitasse spoon, spoon a teaspoon or two of filling into the kibbeh shell. Don’t overstuff, and be careful not to get the filling on the edge of the shell that is going to be closed up, so that it will close easily. 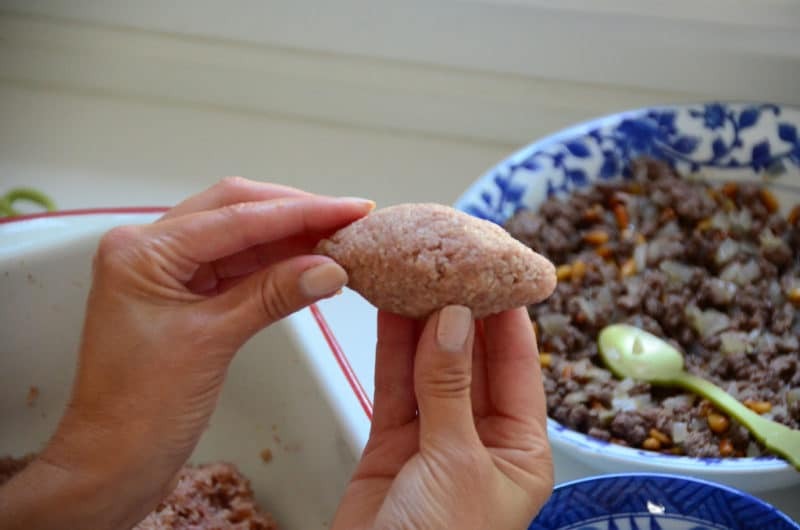 Push the kibbeh together at the open end and gently shape the kibbeh into a torpedo in the palms of your hands, using the tips of your fingers to pull each end out to a point. Smooth the kibbeh with a touch of cold water, making sure there aren’t any openings. 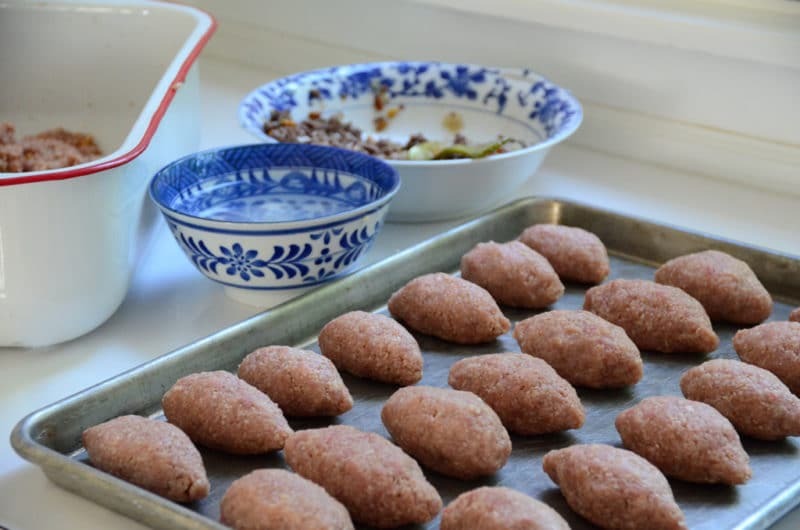 Set the kibbeh footballs on a sheet pan as you make them. To fry the kibbeh footballs, fill a large, heavy, nonstick skillet with enough canola oil to reach halfway up the sides of the footballs. Heat the oil to 375 degrees, or until a small piece of herb dropped in bubbles up right away. Place several kibbeh balls gently into the oil using a large spoon to slide them in (my skillet held ten with some space around each one). Fry until deep golden brown, then turn over with tongs and fry the other side until deep golden brown, about 4 minutes total. Remove the kibbeh from the pan with tongs to a paper towel-lined platter. Alternately, bake the kibbeh footballs on heavy sheet pans in a 400 degree oven. Brush first with olive oil or melted butter and bake until deep golden brown. Cool slightly and serve warm, or cool and serve room temperature. The kibbeh footballs freeze well, and will hold in the refrigerator for a couple of days. 33 Responses to "Kibbeh Footballs, Arras Kibbeh"
For those in the East Lansing area, you need only call Goodrich’s Shoprite on Trowbridge Road – conveniently located next to Woody’s, and tell the butcher you want any designated amount of “kibbee meat,” and they’ll take care of the grinding for you. It’ll be on a clean blade (perfect for some raw kibbee too), and of course, if your last name happens to be Farhat, they’ll inevitably ask if you want it ground “three times, since that’s what all the Farhat’s ask for.” Another winner, Maureen – can’t wait to try this one! Maureen, I start my day by reading your column, nourishment for the stomach, the heart, and the soul. What wonderful memories you evoke, and now I need to have kibbeh footballs. Fortunately I do have a ‘go-to’ Mediterranean restaurant in Albuquerque. So, next trip in, Thursday, I know where we will have lunch. Interesting mini Kibbeh. While the Lebanese Taverna restaurant (Annapolis, Md) makes them small for the sampler plate my Sitto (father’s side) used to make them much larger. Yours look like they are about 2.5 inches long, I guess my Sitto’s were about 4.5 inches long. We kids at the time were not overly fond of Kibbeh (compared to some of the sweets she often made) but as an adult, correction senior adult, I do enjoy them now if dipped in the yogurt sauce. Thanks for sharing via your many articles. I can’t tell you how many times I would walk into my friend’s kitchen and see a large tray of Kibbeh ready to go in or just coming out of an oven. I, too, long for a local Lebanese restaurant. Maureen another great article, we are lucky here in the Atlanta area to have a few choice Lebanese resturants to go to. But if my wife Betty decides to make Kibbeh i trained the butcher at our local Publix’s supermarket how to prepare the meat and show up when the open to make sure it is the 1st thing to go thru the grinder, and to triple grind it. Thanks for your lovely writing and beautiful photography. My mouth is watering from your pictures and from the memories of my mother’s kibbeh, made in every shape and form. Aren’t mom’s always the best cooks??? Where I live in California I’m lucky to find ingredients for cooking Lebanese food, let alone restaurants to buy prepared food. Finally, a store has opened nearby. I can only hope there are enough middle easterners to keep it in business. How fortunate is my family living in the East Lansing area? If I can throw in my own observation, I have noticed here in Beirut that the habra which is the meat that is put together by butchers specifically for kibbeh is unlike anything one will get in the US. It is completely devoid of fat or nerve or whatever, smooth as baby skin and usually made with veal (3ejel); also the bulgur is never soaked, only dipped in water. Still your kibbeh look fantastic considering you have not like most kibbeh -makers I know here, been making them on a daily basis for 30 years plus! They take their meat, SERIUOUSLY! I firmly remember that part of it, through my grandmother! How lucky you are, to have visited Beruit! I just want to say thank you. As I read your e-mail my mouth was watering the kibbeh sounded so good. My wife is taking me out to dinner for my birthday tomorrow, 3/21, and we are going to The Beirut Restaurant, a local Lebanese restaurant. I love their food and I will be ordering the kibbeh. Have a great day! How great Craig, thanks so much. I am very familiar with The Beirut in Toledo, as some family lives there. It’s been far too long and I need to go back! Happy birthday and enjoy your delicious Lebanese dinner! If anyone knows of a Lebanese restaurant in the Kansas City area let me know. We had a great one in the suburb of Lee’s Summit for a few years but it has been closed for several years now. It’s even hard to find a place to buy kishik. The India/Pakistani version just isn’t the same. You’ve heard from both of my sisters so ….now from me. Man they look good and now I know what I’m going to make for dinner Sunday. We do put mint in ours but other than that it’s my Mom’s all the way. I think I’ll go make some laban now, thanks for the kick start…..yummmm! I just checked with my Med restaurant here in ABQ, they do not make kibbeh and know of no one who does. Woe is me. I may have to try my hand at it–TY big time for your recipe, your pics, and for your lovely column. My family comes from Al Mena in Lebanon, my great grandparents on my dad’s side all emigrated but before I wa interested in learning how to cook Lebanese food I was in college and my only remaining Tita Tita and my Tita all passed away, then my great aunt passed away and there went my chance to learn from my elders, which I deeply regret. I can make some but my kids love Kibbee in the shape of footballs and I haven’t been able to make them before. Being a fellow Michigander, when I go back home to the Detroit area I can get Kibbee balls but thanks to you, I will be able to make my 3 daughters their favorite baked Kibbee balls! Thank you so much! That is so great Stephanie! Thank you to my fellow Michigander, and let me know how you and the girls like the kibbeh! Had these in London on vacation. So delicious. Will try your recipe, could be addicted soon, LOL. Wonderful! I’ll love to know how you like them. I love reading your website. I have learned so much. I have friends who buy kibbie from me, mostly simply fried kibbie patties. I make baked also and to cut costs, I stopped putting meat in the filling. I simply sautee onions and then add nuts of my choice (usually pecans because pine nuts are so expensive, therefore raising the price a few bucks). I just thought – why do we meat on top of more meat? Would you stuff shrimp with more shrimp, or chicken with more chicken? I am sure this will get some comments!!! Also, my cousin likes to add laban to the hashwi and that tastes pretty darn good if you love laban! Hi, I enjoy your site! I grew up in a community with a large Lebanese and Syrian community outside of Pittsburgh. Each Labor Day weekend the Syrian Orthodox church would hold a festival and everyone in the community attended and it’s where I learned about Lebanese food. Then I married a man with a Lebanese mother. )( My husband’s grandmother lived around the corner from the church and helped with the cooking for the festival, even though she was a Lebanese Catholic, as she had many friends at the Orthodox church. Unfortunately, she passed away and many of the recipes were lost. She made her kibbee in the domed shape/patty shape and I’d love to have the recipe if you have it from your mom or visit to Beirut. Hello Angie–Thank you! You can follow my arras kibbeh (football) recipe and shape them flatter, as patties. No other recipe needed! Fry them off like that; you can stuff the patties or do as my mother did and just fry the patties with no stuffing and eat them warm. Delicious. I was wondering whether you have a recipe for meatless Kibbeh shells. I grew up in Cyprus and used to eat these all the time but nobody used meat in the shells, only in the filling. Any clues? There are all kinds of meatless kibbehs! Potato, pumpkin, tomato (though the tomato wouldn’t work as shells). See my cookbook for potato kibbeh stuffed with spinach (it’s baked in a casserole pan). I’d prefer to bake my kibbee footballs. You mention 400 degrees but can you tell me how long? Would hate for them to dry out. Try for about 20 minutes, turning them as they bake. Use convection if you have it. If the kibbeh balls aren’t crisp/deep golden on the exterior, put them under the broiler but keep a close eye on them! Love your website and your videos. My family from my mother’s side came from south Lebannon many years ago and I remember my grandma making lebanese food all the time. For the kibbeh she used to add mint and allspice and the smell over the entire kitchen is wonderful. Nowdays I’m doing all my grandma’s recipes with very much proud. Thank You for your recipes. That is beautiful Elias, thank you! How do you pureed onions? Hi Theresa–good question! Onion that is peeled and cut in wedges can be pureed either in a blender or a food processor. In a blender, you may need to add just a touch of water and start-stop-stir several times to get the blades and wedges of onion moving. My grandmother was Syrian and she made kibbeh but normally in the sheet pan (cut in diamond shape, of course). I would love to try to make the ball version but would like to avoid frying them. Wondering if with the air fryer craze, these might be a good option to try in an air fryer? Have you tried it? Air frying is a great idea. Also, we bake them, brushed liberally with oil, and they bake up beautifully! 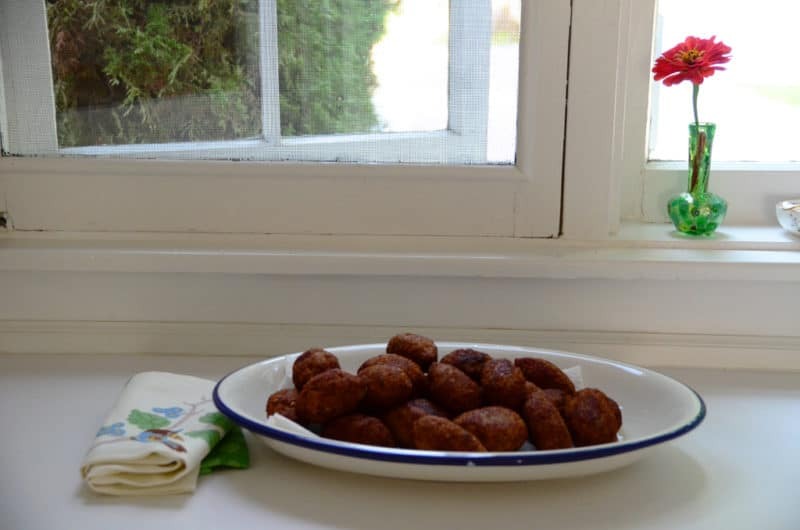 Air frying is a great idea for kibbeh balls! I also bake them, coated liberally with oil, and they bake up beautifully.